The Historical Museum of Crete is the presentation of the history of Crete from the early Christian era to younger times. The company Cretan Historical Studies founded the museum in 1953. Housed in a two-storey neoclassical building, which was constructed in 1903 on an older makeshift family of summer. The new building has been declared a historical monument, because of its architectural form. The tour for the visitor starts from the game Andrew C. Summer, in which an attempt is being made a presentation of the Cretan history with representative exhibits from all collections and time periods. In the exhibition predominate the phantom of city of Handaka (Heraklion) means the 17th-century, a time of great edge of town during the Venetian rule. Following the collections Pottery and sculpture, which is structured chronologically. The starting point is the Byzantine period. As part of the chronological order provision have organised individual thematic units (domestic and imported ceramic, ceramic luxury and everyday use, church and urban architecture, water, etc. 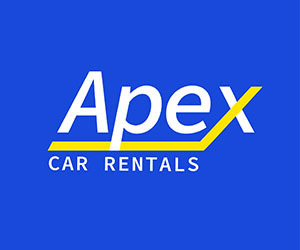 ), which offer the visitor information in addition to the living conditions of the population. It is very important to monetary Collection of J. M. K. , which reveals all the phases of the Cretan economic history from the early Christian period and the 20th century. In the context of Byzantine and post-Byzantine Collection, the visitor shall monitor the development of the painting (σπαράγματα frescoes and icons) and may conclude the coexistence of domestic orthodox population with their conquerors. The modern and contemporary history of Crete is divided into four time phases and rocketed, requiring sections: First is the Ottoman with emphasis on Muslim presence on the island. Include items from the secular and religious life (Ottoman paintings, inscriptions, architectural members of Ottoman religious institutions, documents and glove compartment). The second relates to the period of revolutionary unrest in the 19th century, resulting in the Union of Crete with Greece. Rich historical material bring the revolutionary action and the everyday life of the era (flags, banners, weapons, documents, articles of everyday use, furniture, uniforms, maps, photos). The same group is part of the Gallery with portraits Cretans, to protect fighters. The third referred to in the inter-war period and the fourth in WWII (Ελληνοϊταλικός War, Battle of Crete and National Resistance). Represented the environment of battles and bombings with audible and visual documentation. This section must be completed by the office and the library of the then Prime Minister of Greece, Emmanouil Tsouderou. Following the meeting Nikos Kazantzakis with the office and the library of the author from his home in Antibes, France. Personal keepsakes, manuscripts of his works and the first editions of books in several languages, completes the picture of their life. The Ethnographic Collection completes the tour of the history of Crete, as well as the visitor entered the dimension of long duration of time, particularly in rural communities. The Library of J. M. K. with rare editions, magazines, file local newspapers, a rich set historical archives and photographic material, is addressed not only to researchers but also to the general public. 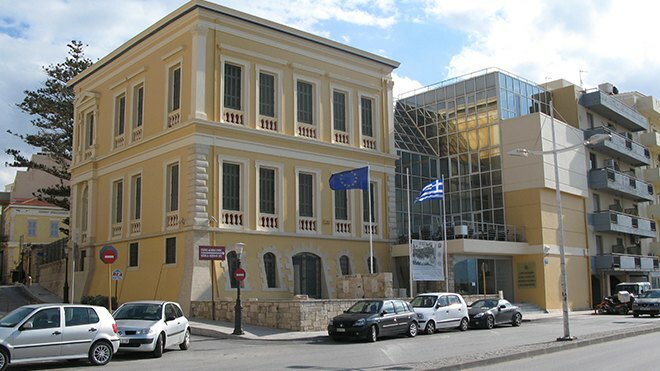 The educational programs of the historical Museum of Crete are designed and implemented by Mrs Fani Kampani, archaeologist – μουσειοπαιδαγωγό, and is completely free to students. The costs of the preparation and implementation of the be borne entirely by the organising Company Cretan Historical Studies. The Historical Museum of Crete is a horizontal cultural space, which covers the range of activities and the reports of all the periods of Cretan history. 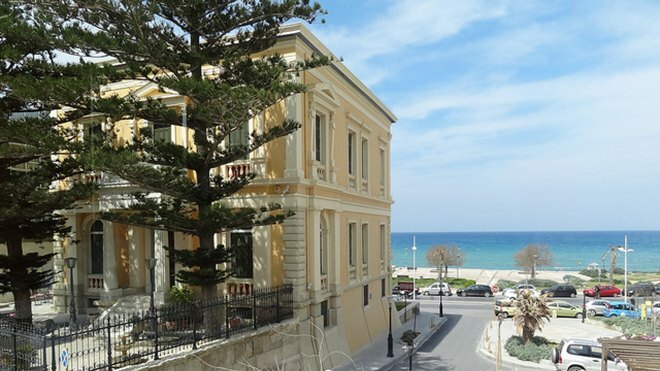 The neoclassical building that dominates the seafront boulevard of Heraklion houses the Historical Museum of Heraklion. Donated by benefactor Andrea Kalokairinos. which presents the most modern methods of museum education throughout the history of Heraklion from early Christian times to the modern era. 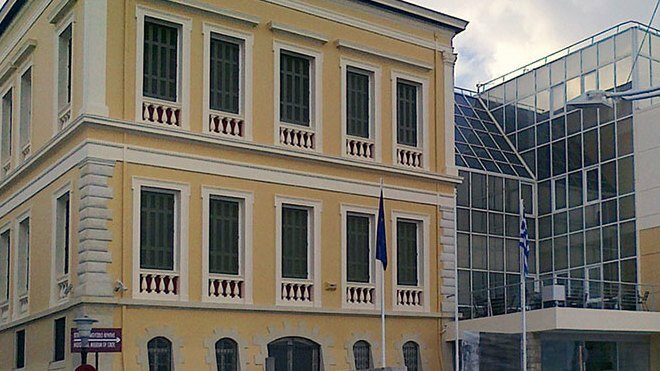 The neoclassical building that dominates the seafront boulevard of Heraklion houses the Historical Museum of Heraklion. Donated by benefactor Andrea Kalokairinos. which presents the most modern methods of museum education throughout the history of Heraklion from early Christian times to the modern era. For all periods out precious relics. costumes, objects, and other items are being exhibited. 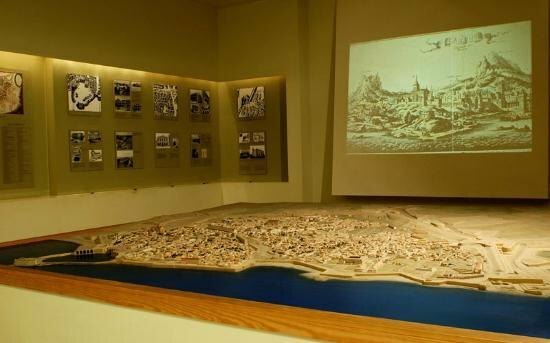 In the Chamber of Andreas Kalokairinos you will see a great model that represents the city of Candia as it was in the 17th century. Then there is the Ceramics and Sculpture Collection, Byzantine Collection and the Venetian one. Of particular interest here are the fronts of the Loggia, the tombstones, the inscriptions and various coats of arms of Venetian nobility. Going up the stairs you will find yourself in front of the hall of El Greco, exhibiting two works of the great artist had created in Venice. The "View of Mount Sinai and the Monastery" (1570-1572) and the "Baptism of Christ" (1567-1570) are the only works of El Greco found in Crete. Next are sections on the Ottoman period, the exhibition on the Cretan Revolution, the collection on the Second World War, the Greco-Italian War and the National Resistance. At the end of touring is the collection of Nikos Kazantzakis, where you can see personal belongings of the great author and his books. Feeling tired from the ride on, you can drink your coffee in the two open spaces that work in the museum: the backyard of the building and inside the building, where in front lies the beautiful view to the Cretan Sea. Even the museum has a library of rare books, local newspapers and photographic archive material, which is available to the public. The museum is housed in the same building as the old Venetianturkey Headquarters Complex, which was within the perimeter of the Venetian castle, which was strengthened during the Turkish occupation.